Lange Custom Builders is a family owned general contractor based in Archbold, OH and serving northwest Ohio since 1998. Your Northwest Ohio Builder That Cares! Established in 1998, Lange Custom Builders provides general contracting services for commercial and residential clients in the northwest Ohio, northeast Indiana and southern Michigan areas. Based in Archbold, Ohio, we strive to provide honest quality work and use our vast experience to uphold our high standards on every project. 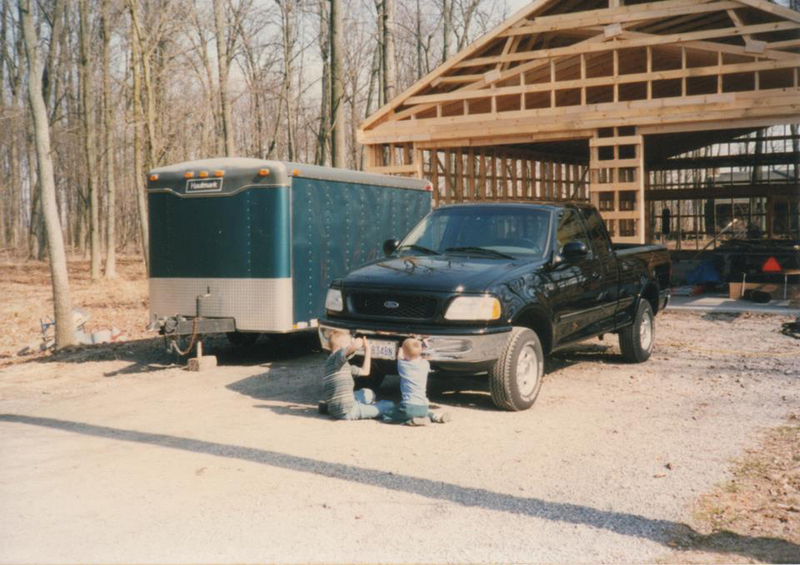 Building the Lange Custom Builders Shop with the first green trailer and black truck. Lange Custom Builders specializes in commercial and residential projects consisting of new home construction, additions, remodeling, roofing, concrete work, custom cabinetry, as well as many other projects that can be seen on our services page. Some examples of commercial buildings we have built are: Archbold Dairy Queen, Wauseon Community Pregnancy Center, Bryan High School Football Stadium Concession Stand, NOFP office space in Wauseon, Brush Creek Sales and Rental in Archbold. As a family owned company with two generations currently working, being careful and trustworthy in your home and business is a priority to us. We would want the same respect on our property. It is a privilege for us to work for all of our customers and want to show you the courtesy of leaving every night with a clean work area and putting everything back into its right place when we are finished with the project. With this promise, many have chosen us to build for them. If you would like to speak to a few of these customers, please write to us on our contact page. Lange Custom Builders has a wide range of experience in many different kinds of projects. We feel this experience guides our project planning and scheduling so we can be accurate and timely. Our experience also fuels creativity and practicality during the drawing and planning stages of each product. As your general contractor, we will work with you and provide drawings of floor plans and cabinets so you can better visualize the end product and make changes if needed. We also work alongside of architects for residential and commercial building plans. Our designer, Lindsey, is always available to help you with the creative process of choosing the right paint color, stain, floor coverings and many more decorating decisions. If you own an older home and are concerned about lead paint, we can help you. We are a Lead-Safe Certified Firm. Certified by the EPA, we can safely remove lead paint from your home. As a fully insured general contractor, Lange Custom Builders can help you with any building needs you may have. We truly care about our customers and want to help you make the wisest decisions possible when guiding you through each step of your project.